I see you there with your tower of overwhelming books and your regulation, closed-toe, water-resistant ( among other things) shoes. I see your stethoscope that will never be cleaner or shinier than it is right now. Scrubs feel like a crisp shield of armor over your young skin. You delight in putting them on – – even if a fairly unattractive patch must shine a light on the infancy of your practice. I see that mountain behind you . . . the one you just climbed to get a chance to climb this – – – an even greater and bigger mountain. Your head is dizzy from spinning in a sea of learning objectives, syllabi, and a whole new world of terminology that is as exciting as it is terrifying. You will encounter. . . . early mornings that feel like night, nights that go into early mornings, post-conferences that feel like forever, pre-conferences that end far too quickly, people who think they know it all, people who know they do not know enough, smells that make you question your career choice, doctors that make you question their career choice, the worst grade you have ever had, the best day you’ve ever had, more frustration and disappointment than you were expecting, more accomplishment than you can describe, and the kind of friendships that only times of war can create. You will question yourself and doubt your abilities. You will question God and His calling you to this place. You will cry every kind of tears that your body can make. . ..
and you will be broken down. . . .
And then you will be built back up – – – with each clinical completed, each case study revealed, with every thank you from yet another patient, with every skill you add to your list. Every time your soul whispers I can’t do this just before your body does the task perfectly – – you are being rebuilt. And in a couple of years what seemed like forever will be over so very quickly. . .
those friends you couldn’t live one day without . . . will drift away to their assigned stations. . .
those five letter you dreaded (NCLEX) will be funny story you will tell for the rest of your days. .. .
and the nursing student you are today will be a ghost. . . just a thin, fragile preview of the journey you will take. . . as you are granted the greatest privilege of one of the most valuable professions God created. . . . YOU WILL BE A NURSE. 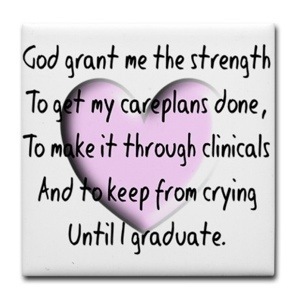 So stay strong my precious, little baby nurse – – – it is not easy to grow so much in such a short time. . . but. . .
it is worth it. . . . Oh Yes, it is worth it.